Earth Day is celebrated every year on 22nd April to promote awareness about the Earth’s environment. Unfortunately, humans have upset the balance of nature and, as a result, the world is facing the greatest rate of extinction. The rapid reduction of plant and wildlife populations on a global scale, is directly linked to causes driven by human activity: climate change, deforestation, habitat loss, pollution and pesticides to name a few. In order to fulfill their CAS requirements, IBDP CAS students must work on several independent and collaborative projects. One of these projects included an internship with World Wide Fund (WWF). In addition to other tasks, they were also required to research, plan and execute a sustainable project with strong links to community service. This project was not only approved by the WWF panel of judges but highly spoken of as well. 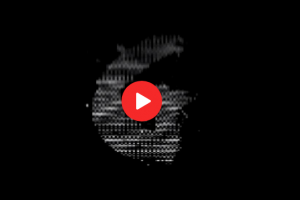 As part of the Summative Assessment task for the Assessment task for the second transdisciplinary theme, ‘Where We Are in Place and Time’, the students of PYPIV hosted a showcase , ‘Architects o f Tomorrow’. The Central Idea of the theme revolved around explorers who created new paths to improve the lives of people. 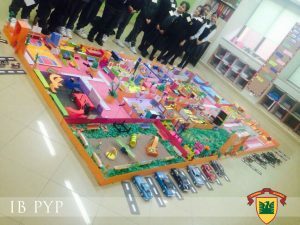 The students served as explorers and architects simultaneously, as they inspected the current design of Learning Alliance PYPand discussed modification of the current building structure. They envisioned the design through systematic investigation and studied a variety of materials/sources in order to construct a successful prototype of their proposed model. Throughout the theme, the students demonstrated the learner profile attributes of thinkers and risk takers. In order to inculcate the concept of community service, the students of Learning Alliance IB PYP held a Bake Sale on 1st February, 2017. 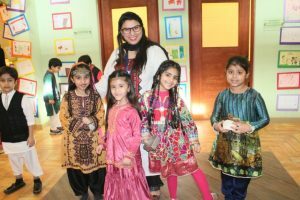 The students expressed immense interest and zeal in the activity, where some even went a step ahead and baked the healthy food items put up for the sale, themselves. 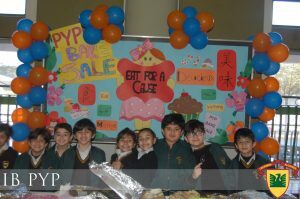 The PYP Bake Sale was another initiative to help our students become more confident, conscientious and caring individuals. Initially planned as a small event, it turned out to be a massive success due to the incredible array of delectable goodies. 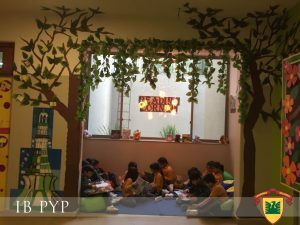 PYP students celebrated their love of reading by organising week long activities focused upon books and different genres. The week kicked off with students excitedly decorating their classrooms with book covers and reading materials of their choice. During the week, we had a bunch of enthusiastic parents volunteering to come in and read to the students. The culmination of the reading week was a colourful and invigorating Book Parade. The students were dressed in fascinating costumes, with rich and vivid colours, exhilarated to be a part of the procession. There were flares and gowns and masks and swords; there were also tiaras and flowers and boots. They took the round of the entire school, where the students right from Preschool to Junior and Senior school were standing to applaud the brilliant display inspired from various books. Radio is recognized as a powerful communication tool and a low cost medium designed to reach the widest audience in the world and has a strong and specific role in emergency communication and disaster relief. IB @ Learning Alliance observed World Radio Day on 13th of February, with great enthusiasm. Students were excited to learn about the new technological forms, radio is taking up, such as, broadband, mobiles and tablets. They learnt about various functions of the device and how they can broadcast one message to the entire world through it. 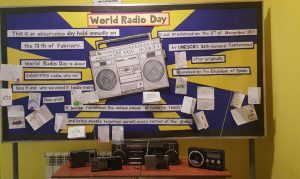 World Radio Day observance marked a new chapter of students’ understanding of this device as an important instrument of bringing people together and touching lives. The Inter Campus Book Reading competition was held at Learning Alliance Aziz Avenue on 24th November, 2016. 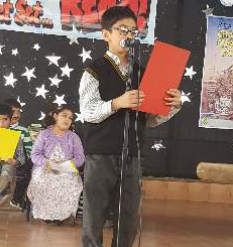 Participating students had the opportunity to narrate from ‘Matilda’ and ‘Charlie and the Chocolate Factory’, literature that has played a vital role in developing a child’s imagination. Muhammd Hisham Ali from PYP IV B was awarded 2nd position at the Reading competition. IB MYP students have been offered 2 weeks of Remedial classes, aiming to have a thorough revision before their Final Assessments. The remedial classes are being conducted after school for an hour, Monday thru to Friday. Students have been divided into groups of 10 and their facilitators/teachers are addressing to their individual problems on ‘one on one’ basis. By the end of these Remedial Classes, we hope that students are able to further enhance their knowledge and understanding of the subjects they are studying in the IB MYP. As part of the pre-confabulation sessions of the Final Term Assessments, a Student-led Conference was held by our IB MYP students on Saturday, 9th May. The purpose of this conference was to encourage students to give an honest reflection of their learning journey in the Academic Year 2014-15. Students spoke about their strengths and weaknesses, the projects they look forward to and the ideas they want to pursue. The session saw smiles and candid discourse while the students brainstormed solutions to the problems they have faced. The conference was entirely student centric; students were the primary speakers and teachers and parents intervened only when required. It was a productive experience as the students realized their strengths/ achievements.